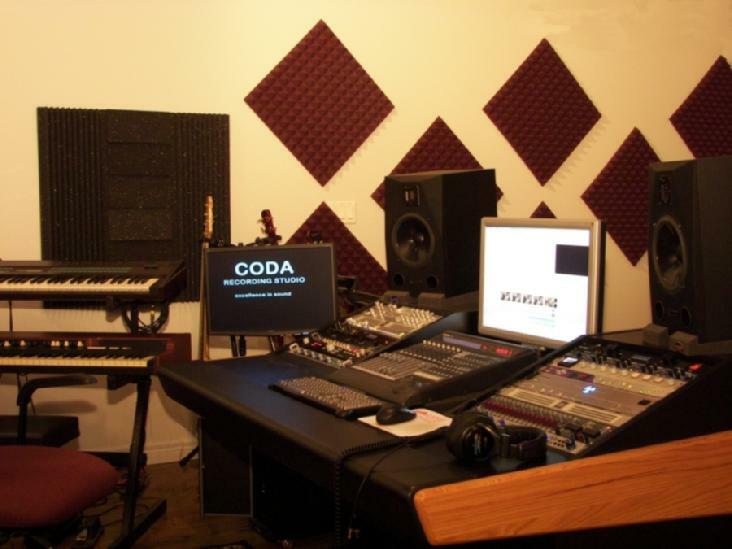 CODA Recording Studio - Big Studio Sound At Rates That Rock ! CODA Recording Studio is a full service recording studio located in the heart of the East Coast Music scene - Cape Breton Island, Nova Scotia. What's the most common thing people say when they first visit our studio - just one word - WOW ! Although we are equipped with a boutique collection of world class analog and digital recording equipment, we also have one of the most competitive studio rates you will find anywhere - as low as $45.00 CDN per hour plus tax. First Class is the name of the game at CODA Recording Studio, and that is exactly what you will get. The comfortable and relaxing atmosphere at CODA will help you be at your best - and you can rely on us to capture it. CODA's work has appeared with such artists as Diana Krall, Bryan Adams, Anne Murray, Bruce Cockburn, John McDermott and our own Rita MacNeil (Universal Music - A Canadian Christmas 3). CD Tracking, Mixing, and Mastering - full length, EP, or demo. On Location Recording - of groups such as choirs, acoustic acts, or small bands. We have a full 24 track mobile setup that will give you full studio quality. Audio For Video - When recording your special event video, we can record superb, high quality audio at the same time. Later, back in the studio,we can replace the camera's low quality audio with our high quality mixed and edited audio. We can make you sound like a pro ! Remote Session Recording - Using our world-wide FTP (file transfer) site, we can collaborate with other recording studios anywhere in the world that have high speed internet. If you want a touch of Cape Breton on your current project we can provide it. We are the link between you, your local studio, and most of the top session players in Cape Breton. Voice-Over Recording - for radio, television, and film. Our work has been featured locally, regionally, and nationally, and has appeared on such networks as TSN, YTV, etc. Archival Transfer - from old phono or tape recordings. We support most sizes and speeds of photo records, plus most formats and speeds of both 1/4" and 1/2" magnetic tape. We also have tools to make a significant improvement in the quality of the audio, eg: noise reduction, voice enhancement, etc. Vocal and/or Drum Tracking - for home recording enthusiasts. Bring in your reference mix and your musicians, and we'll track pristine drums and/or vocals for you to take home and mix yourself - or, we'll do it for you ! Our low rates make it possible. Be sure to check out our sample MP3s, along with our featured artists. Contact us by email, phone (902)562-CODA(2632), or fax (902)562-0539. Big Studio Sound At Rates That Rock !